Your lifestyle depends on your healthy vision, so when you’re eyesight becomes cloudy or blurry, it can be difficult to perform everyday tasks. You may have trouble driving and reading, and you may struggle through your usual routine. If you suspect you’re developing cataracts, talk to the professionals at Eye Care & Surgery. Our experienced doctors offer quality cataracts treatment to help restore your vision. Our team operates with respect, courtesy, and empathy. We make a point to offer kind, understanding services, and when you entrust the health of your eyes to us, you can rest assured you’ll be adequately taken care of. If you start to develop cataracts, we know it can be a troubling and sometimes alarming experience. If you have any questions, our team will happily address your concerns and explain the situation. We take pride in our compassionate approaches, and we’ll do what we can to ensure you’re comfortable and familiar with our cataracts treatments. To better serve the area, we have four locations-one in Blacksburg, VA; another in Hardy, VA; and two more in Roanoke, VA. Feel free to reach out to the office nearest you. Our well-trained and experienced team will schedule you in as soon as possible. A Cataract is the clouding of the normally clear crystalline lens within the eye. When we look at an object, light rays travel into our eye through the pupil and are focused through the lens onto the retina, a layer of light-sensitive cells at the back of the eye. 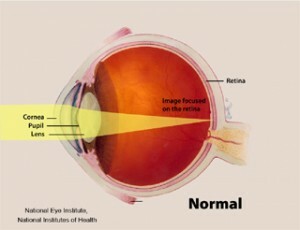 When the lens is not clear it does not properly focus light onto the retina. This is called a cataract. When a cataract causes bothersome vision problems that interfere with your daily activities, your eye doctor at Eye Care & Surgery may recommend surgery to remove the cataract. With cataract surgery, your eye’s cloudy natural lens is removed and replaced with a clear artificial lens implant (called an intraocular lens or IOL). Today there are several new lens implant options available called multifocal or accommodative lenses. These newer IOL types may reduce or eliminate the need for glasses or contact lenses. The surgeons at Eye Care and Surgery offer some of the most effective intraocular lenses (IOLs) currently available for replacement of cataracts.